Why Trump’s Iran speech was one of the most dishonest and dangerous ones he’s given. Trump’s speech on the Iran deal might be his most dishonest, and also his most damaging. President Donald Trump speaks about the Iran nuclear deal in the Diplomatic Room of the White House on Friday. President Trump’s statement Friday on the Iran nuclear deal may be the most dishonest speech he has ever given from the White House—and, depending what happens next, it could be his most damaging. It flagrantly misrepresents what the deal was meant to do, the extent of Iran’s compliance, and the need for corrective measures. If he gets his way, he will blow up one of the most striking diplomatic triumphs of recent years, aggravate tensions in the Middle East, make it even harder to settle the North Korean crisis peacefully, and make it all but impossible for allies and adversaries to trust anything the United States says for as long as Trump is in office. It is well known that Trump hates the Iran nuclear deal, which is formally called the Joint Comprehensive Plan of Action, or JCPOA. During the election campaign, and again in Friday’s speech, he has called it “one of the worst and most one-sided transactions” in U.S. history. And yet, all of his advisers, all the European allies who co-signed the deal, and even the vast majority of Israeli military and intelligence officers—including some who opposed the deal in the first place—have urged him not to pull out. The problem, from Trump’s point of view, is that the Iranians are abiding by the deal’s terms. The JCPOA required Iran to dismantle the vast bulk of its nuclear program, essentially closing off every road to a nuclear bomb—in exchange for which the U.S. and the other countries would lift sanctions, which had been imposed as penalty for its nuclear activities. Just before the deal was signed, Congress—which had no say in the matter, since it was not a formal treaty—passed a law called the Iran Nuclear Agreement Review Act. This law requires the president to certify, every 90 days, that Iran is still in compliance. If he certifies otherwise (in other words, if he acknowledges that Iran has been caught cheating), Congress could vote within 60 days to reimpose the sanctions. The Republicans who wrote this law thought they were pulling a fast one: Iran was certain to cheat; President Obama or Hillary Clinton (his most likely successor) would be put in the embarrassing spot of admitting it; and Congress would destroy the deal. But, as the inspectors have reported time and time again, Iran is not cheating. Even Trump has had to certify twice that Iran was in compliance—and he was getting sick and tired of it. The most recent time he signed the certificate, he said that he probably wouldn’t do it the next time. The next 90-day deadline is this Sunday. Iran is still in compliance. So what did Trump do? He decided to decertify Iran anyway and to invent reasons why. Then he tossed the mess to the leaders in Congress for them to decide what, if anything, to do about it. He cited a few reasons for his action, all of them either false or irrelevant. His main reason was that the Iranian regime is full of bad people doing bad things. The first half of his speech was a recitation of these things, most of them dating back three or four decades: the regime’s occupation of the U.S. Embassy in 1979, its support of Hezbollah bombings in 1983 and ’84, its harboring of terrorists in the wake of 9/11, and its more recent support of atrocities in Syria and Yemen. All of these facts are indisputable, but one could as easily cite them to support the deal: We need the deal, one could say, to keep this violent, destabilizing regime from building nuclear weapons on top of everything else it’s doing. During the Cold War, five American presidents negotiated arms-control treaties with the Soviet Union, even while Moscow spouted a communist ideology dedicated to the overthrow of capitalism, armed and otherwise supported revolutionary regimes and movements all over the world, and persecuted domestic minorities. None of this stopped even Ronald Reagan, the most fiercely anti-communist of these presidents, from pursuing treaties to reduce the size of both sides’ nuclear arsenals. Nor did Reagan or any other president threaten to cancel an arms treaty already in place if the Soviet Union didn’t stop espousing communism or supporting revolutionaries or oppressing its own people. To the extent the Iran deal is one-sided, it’s sided against Iran. Unlike the U.S.-Soviet arms deals, we didn’t have to give up any of our weapons; we only had to lift sanctions that we and other countries had imposed to pressure the Iranians to dismantle their weapons program—and now that they have done the dismantling, it’s only fair to lift the sanctions. More than that, the U.N. had passed a different set of sanctions against Iran for its tests of ballistic missiles and its support of terrorists. Even after the Iran nuclear deal was signed, those sanctions remain in place. There is no need to rewrite the Iran nuclear deal to address these other problems; they are already being addressed. Speaking more directly of the nuclear deal, Trump claimed that the deal “allows Iran to continue developing certain elements of its nuclear program,” to the point where, “in just a few years, Iran can sprint toward a rapid nuclear capability.” This is simply false. The Iranians are permitted to develop advanced centrifuges, but they are limited in how many of them they can build or store, they cannot use them to enrich uranium, and they have destroyed or shipped away the stockpile of enriched uranium they already had. And while some of these prohibitions lapse after 10 years (which is farther away than “a few years”), others don’t expire till 15 years, still others 25 years, and some—including the International Atomic Energy Agency’s right to inspect facilities—have no expiration at all. Trump then went further. “The Iranian regime,” he said, “has committed multiple violations.” He cited three. First, he said, on two separate occasions, they exceeded the limits of 130 metric tons of heavy water. This is true, but the lapse was corrected immediately and had no impact on any program or capability. Second, he said, they “failed to meet our expectations in its operation of advanced centrifuges.” I have no idea what this means and can’t find anyone to decipher it. Third, he said, the Iranians “intimidated international inspectors into not using their full inspection authorities.” This is complicated. Under the deal, the IAEA can inspect any and all Iranian sites declared to be associated with nuclear programs (past or present), and it can also inspect other sites if it shows cause for doing so. Iran demanded this provision of “cause,” arguing (reasonably) that foreign intelligence agencies could otherwise use the deal as a vehicle for endless espionage. Iran has put up resistance to some of the inspectors’ requests, but they have all been granted. The deal allows 24 days for the requests to be honored. Critics say that would give Iran enough time to hide illegal activity. But, during the debate over this provision, intelligence officials noted that they could surround the facility with surveillance tools, which would detect any clean-up effort, and that, once inside the site, inspectors could spot, for instance, radioactive debris. So, it’s a bit tricky, but the deal allows more intrusive inspection and verification than any arms-control treaty in history. How then did Trump justify decertifying Iranian compliance? By referring to an obscure, and ambiguously phrased, clause in the Iran Nuclear Agreement Review Act. The main clause of this act requires the president to certify every 90 days that Iran is in compliance with the deal. But it also requires the president to certify that the lifting of sanctions is “appropriate and proportionate” to disarmament measures taken by Iran. In his speech on Friday, Trump said, “Based on the factual record I’ve put forward, we cannot and will not make this certification.” But there is no such factual record. The Iranians have terminated all the programs that the deal has required them to terminate at this point, and the “violations” that Trump cited are fiction. If anyone is in violation of this deal, it is Trump. So what will he do about it? At this point, as he has done on many other issues, Trump abrogated his responsibility; he doesn’t want to take the heat for taking any steps that might turn out badly so he put the burden on Congress. He can’t rewrite the Iran nuclear deal, much as he’d like to; so he told Congress to rewrite the Iran Nuclear Agreement Review Act. Trump’s national security adviser, Lt. Gen. H.R. McMaster, has been discussing possible ways to do this with Sen. Robert Corker, the Republican chairman of the Senate Foreign Relations Committee, who was the main author of the original act and who is currently in a spat with Trump. (What effect that spat will have on a prospective revision, we shall see.) One thing Corker and some others might do is draw a red line that would trigger the resumption of sanctions if Iran crosses it. For instance, if it is calculated that Iran could sprint to a nuclear capability within one year, the sanctions are reimposed. Or if Iran doesn’t agree to extend the expiration of certain clauses of the deal, the sanctions are reimposed. This is what he has wanted to do all along. 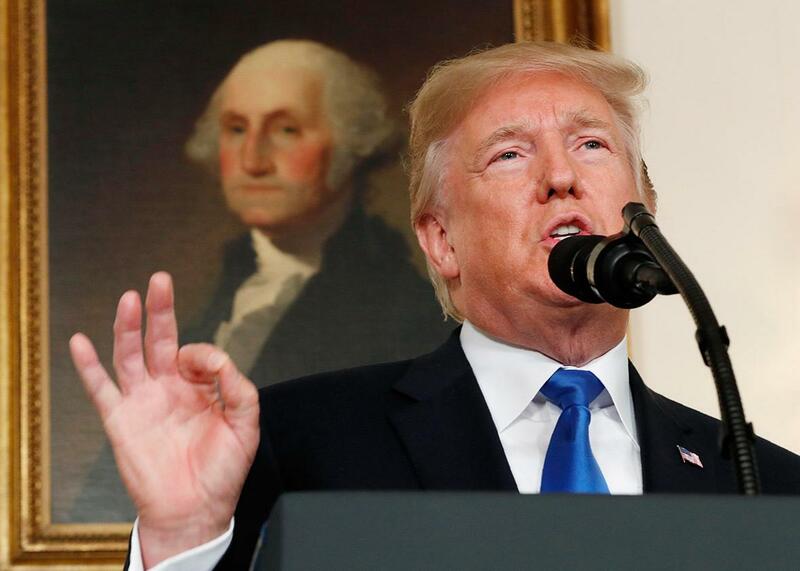 The formula he recited in his speech on Friday—decertify the deal but don’t do anything about it just yet—has been viewed by some as a “compromise,” and so it is, in a way. It was a ploy, devised by his aides, to avoid both a Trump tantrum and a diplomatic disaster, in the short run. But the formula will trigger one or both of those things before long, and Trump has made his preference clear—if a choice must be made, he’ll take diplomatic disaster. And a disaster it would be. If the United States pulls out of the JCPOA, the deal won’t necessarily fall apart. It is a multinational agreement—signed by the five permanent members of the U.N. Security Council (the U.S., Britain, France, China, and Russia), along with Germany and the European Union. Those other countries could decide to keep the deal going and to make up for any business that Iran loses as a result of resumed U.S. sanctions by stepping up their own investment and trade. Then the United States would be isolated—and blinded by lack of access to the intelligence provided by the inspections (which would be continued by the IAEA). Pulling out would also damage our posture, and possibly trigger catastrophe, in other global hot spots. If our face-off with North Korea is to end without war, it will require some sort of diplomatic settlement. But who will want to negotiate with the United States, and who would believe any deal Trump would sign or guarantee he would make, if he pulls out of the Iran deal, even though Iran is abiding by its terms? And all of this is happening because Trump doesn’t like the Iran nuclear deal. He doesn’t like it because it was Barack Obama’s triumph, because he doesn’t like Iran, because his friend, Israeli Prime Minister Benjamin Netanyahu doesn’t like Iran and doesn’t like the Iran deal, and because he, Donald Trump said that he would kill the deal, and if he doesn’t, his “base” will be upset. This is what Trump’s Cabinet secretaries have been putting up with. Secretary of Defense James Mattis, asked by Congress whether we thought we should stick with the Iran deal, replied, “Yes, I do.” Secretary of State Rex Tillerson has been mumbling a lot of nonsense lately, saying, for instance, that Iran is violating “the spirit” of the deal (which is completely false: This deal has no spirit beyond its contents, and Iran is not violating those), but even so, he, when pressed, has said it is better for the United States to live up to its promises. Some Republicans criticized Obama for withdrawing from the world, but it is Trump who has practically enshrined a withdrawal doctrine. He has withdrawn from the Trans-Pacific Partnership, has withdrawn from UNESCO, is on the verge of withdrawing from NAFTA, and is now getting set to withdraw from the Iran nuclear deal. Our allies are already looking for new partners and new security guarantors. Trump may soon discover that America can’t be first if it’s all alone.